When Words Collide–You Get Fireworks! 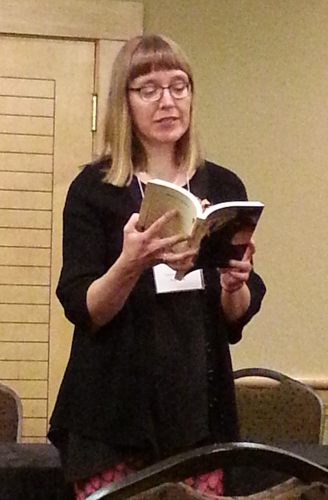 A fabulous full-day workshop on “The First Five Pages” by Faith Hunter, author of the Jane Yellowrock vampire hunter books. Her advice to “bait and hook” by giving the reader something to latch onto (an intriguing main character, interesting setting, and immediacy in writing) and wonder about (hint of conflict to come) made me realize that my FFP were completely wrong. Now I’ve rewritten them to start where the story starts, and am in the middle of “making lasagna” by sprinkling bits of the backstory throughout the story. And finding it’s better this way. Hearing an acquisitions editor from a publisher I really like saying she wants to see my book. ♥ ♥ ♥ This was during the Fantasy genre “Live Action Slush”. In a LAS, you anonymously submit the first page of your manuscript , to be read out loud to a panel of four authors and editors. They put up their hands when they would stop reading the manuscript in a slush pile, and the reader stops when three hands are up. My page (freshly re-written after workshop #1) made it all the way to the end. And they clapped. And said it was fantastic. And…first sentence. Wow. Learning about Eco-Fiction, or fiction that seeks to create and build dialogue about protecting and valuing the world we live on. Realizing that I write this. Draco’s Child is about restoring a damaged eco-system–on another planet, and Bill Bruin is about a bear and a raven learning to delight in winter. The ones I’m working on do this too. More accurately, I write eco-fantasy. Thus my tagline: Exploring Nature in Imaginary Worlds. Another workshop, this one on the 20-second elevator pitch. Faith Hunter (see point 1) and David B. Coe helped me hone my pitch for the Middle Grade novel I will be pitching to an editor from Scholastic Canada at the CANSCAIP Prairie Horizons conference in September. Giant genetically-modified caterpillars, here I come! Going to Regina writer Marie Powell‘s launch of her historical fantasy book Hawk. A half-day plot workshop with Daniel Abraham, in which he re-told MacBeth as a story about a self-help book, computer hackers, and ballroom dancing. You can read it here. Watching Brandon Mull channel his inner 10-year-old describing his Middle Grade fantasy books in enthusiastic detail. Learning 10 ways to hide a clue in a mystery novel, from the Calgary Crime Writers’ Association. Having 20 people show up to hear my WordPress Workshop when they could have been listening to Diana Gabaldon or any of the other 9 presenters. Spending time with a whole lot of Regina writers, a bunch from elsewhere, my cousin Carol, and an anthology of other writers (collective nouns are fun) who are now new friends.